TLA-100.3 Fixed Angle Rotor Assembly, Fixed-Angle Rotor (30 deg Angle), Titanium. Major Applications: Pelleting of subcellular fractions in 5-30 minutes; pelleting RNA in 1-2 hours; plasmid DNA separation in 6 hours. 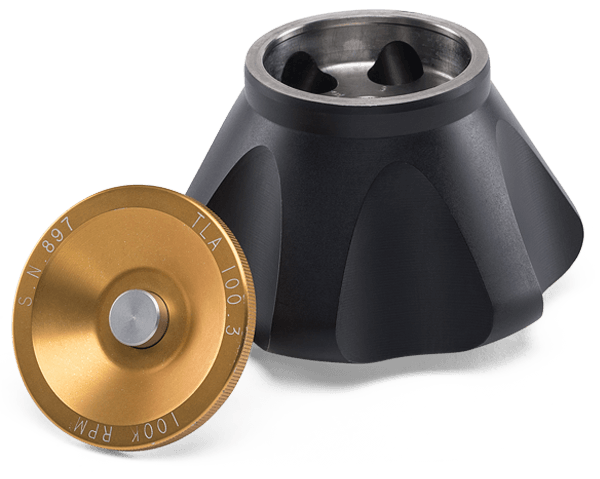 Note: Non-precipitating solutions up to 1.7 g/mL in density can be run in this rotor without a reduction in rotor speed. For use in the Optima MAX-XP Benchtop Ultracentrifuge, Optima TLX personal micro-ultracentrifuges, and Optima MAX high-capacity personal micro-ultracentrifuges, and the discontinued TL-100 and Optima TL micro-ultracentrifuges.